Portrait of Chief Two Guns White Calf. Painted by A. J. Davis, apparently from a photograph on a postcard (shown below). n.d. The painting above was purchased by my good friend, Wes, at a thrift store, recently. He didn’t know who the artist was nor anything of his story. He just liked the painted rendering of the portrait. A bit of digging online revealed that the painting was made by Alfred John Davis (a Vancouver artist) – who was unknown to Wes or me – from a photographic postcard of Chief Two Guns White Calf. A. J. Davis was born in England in 1868. He later immigrated to Canada and settled for a few years in Winnipeg. He came west to Vancouver in 1891, and he married Ellen Ann McCannell here in 1897. His occupation in Winnipeg and in Vancouver was as a railway coach painter for the Canadian Pacific Railway (later on, in Vancouver, he became foreman of the CPR paint shops here). Although I’m very appreciative of the Sun for assigning a reporter (albeit, an anonymous one) to write the profile of the today-all-but-unknown artist, if I’d had my ‘druthers’, it would have been helpful to have more detail about A. J. Davis’ work for the CPR, including what exactly his job entailed. Was he responsible for any of the famous CPR posters? Was he responsible for painting scenes in railway coaches (in which case, most of his career art work must surely now be gone) or (more likely), was it his job to see that all CPR property was properly maintained with a fresh coat of paint, inside and out? CVA 152-1.180 – [Construction progress photograph of the CPR Pier “A-B” extension] July 1913. 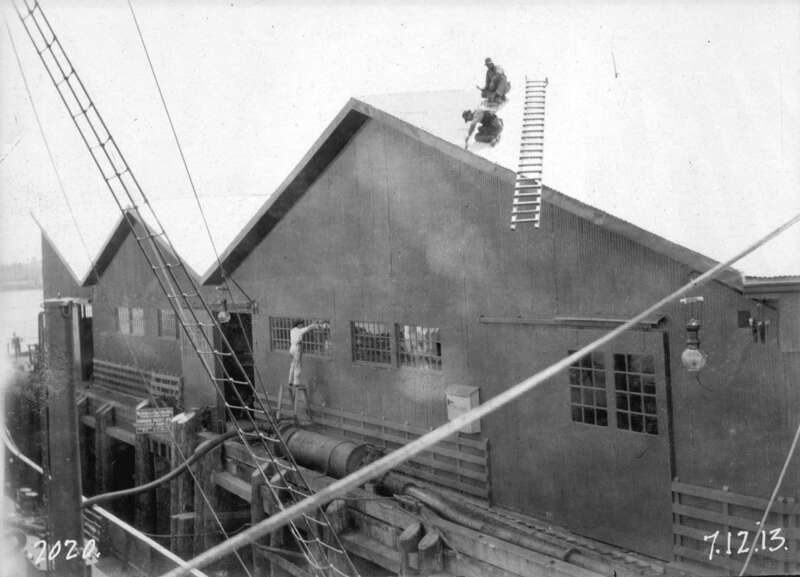 A worker is painting the exterior of the pier. Was this the sort of painting work with which A J Davis was principally concerned? A. J. Davis died while still in harness with his employer of 45 years on January 25, 1933. His widow died in 1953 in Burbank, CA. What happened to the treasures in their former home is unknown to me. CVA – AM1052 P-872 – The five Georges (ca 1910). 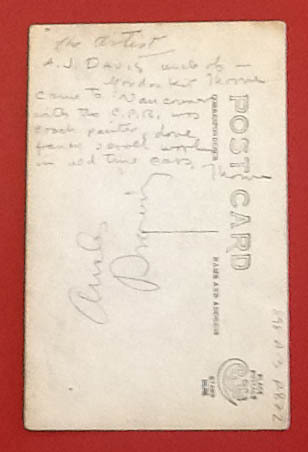 The above postcard (front and verso) is the only piece of art and information available at the City of Vancouver Archives pertaining to A. J. Davis. 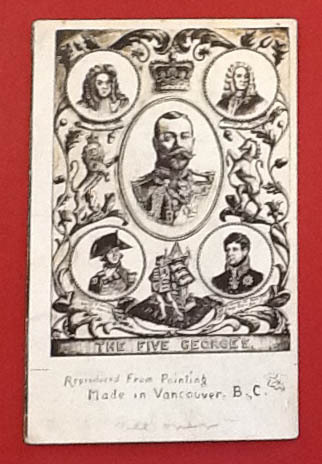 The drawing of the “Five Georges” is a reproduction of a painting, according to the note on the card’s face. *This claim that the Davis item is the sole extant piece of the Beaver isn’t accurate. See here for an image of an auction mallet composed of wood from the craft and a reference to “a number of other such items” from the Beaver, including its boiler which resides outside of the Maritime Museum. **I appreciate very much the information embedded here in an online request for help with additional details about her grandfather, A. J. Davis. Without the reference in her post to the newspaper article profiling Davis, I would have had very little to say about his life and vocation (and avocations). April 19/16: I have just found a listing of a few others of AJD’s work; they were on display at the Theatre Royal (aka the first Orpheum Theatre), as part of the First Annual Exhibition of the Arts and Crafts Association, September 25-27, 1900. This entry was posted in art, biography, Canadian Pacific Railway (CPR) and tagged Alfred John Davis, artist, bc, Beaver, chief two guns white calf, cpr, history, Maritime Museum of Vancouver, Museum of Vancouver, native american portraits, painter, railway, vancouver, vancouver sun. Bookmark the permalink. I knew. I’m pleased that you enjoyed the post. Thanks for commenting. 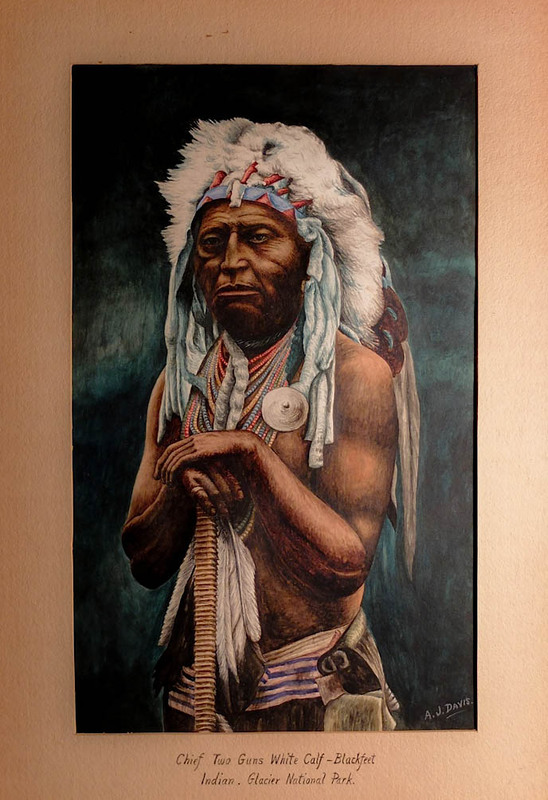 I have an original piece of A J Davis painting of an Indian Chief and I’m looking to find additional information and perhaps value of his art any help would be appreciated.